Change.org recently reported on the top 10 most popular petitions of 2016. 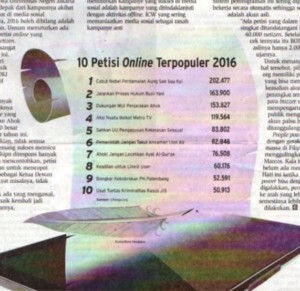 The petition on Change.org for the JIS case was one of the top 10 petitions in Indonesia – signed by 50, 913 netizens. People continue to sign the petition. In addition, crowdfunding site Kitabisa.com noted that in the national issue category, the JIS case was able to raise Rp 244 million. Funds from this account are used to support the initiatives of Kawan8.